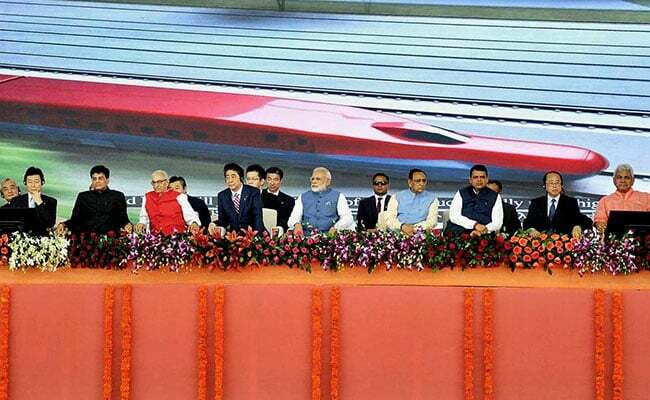 Ahmedabad: Critics who earlier dismissed the bullet train as "big talk" are now asking what use it is, said Prime Minister Narendra Modi today after inaugurating work on India's first bullet train in collaboration with Japan, whose Prime Minister Shinzo Abe jointly launched the project in Gujarat's Ahmedabad. "When I was in Gujarat and used to speak about the bullet train, they said Modi only talks of bullet trains in India... They kept asking when will he get it. Now that they see I have actually got the Bullet Train to India, they ask why are you getting a Bullet Train?" the Prime Minister said. "It's a new India which has to fly high," PM Modi said. He said the ambitious project would bring pace to development in the country and that no country can grow if they don't dream big. "To grow one needs to expand his dreams and decide his strength to achieve that," the Prime Minister said. The first bullet train is expected to begin running between Ahmedabad and Mumbai in 2022. "The bullet train is not India's priority," said Congress leader Anand Sharma, adding that the strategic partnership between Japan and India is very important and there are more crucial issues to be discussed. "Our prime minister should not limit it to the photo opportunity and theatrics. There are serious issues on the agenda. Prime Minister Modi has misplaced the priority," Mr Sharma said. Sharp criticism also came from the BJP's Maharashtra ally Shiv Sena, which described the new bullet train project as PM Modi's "expensive dream" alleging that it will "loot the nation of Rs 1,08,000 crore". Among the problems that the Shiv Sena listed in an article in its magazine the Saamna, is that the bullet train will have eight stops in Gujarat and only four in Maharsahtra. And that Maharashtra will "have to shell out Rs 30,000 crore" for it. It compared the project to those launched by former Prime Minister Jawaharlal Nehru of the Congress, like the Bhakra-Nangal Dam, the Bhabha Atomic Research Centre and other schemes, saying, "All those projects were needed by the country. Is the bullet train a project of national importance for which such a huge amount is being spent to cover the 508-km distance at 350-kmph speed?" The bullet train, which is expected to halve the travel time between Ahmedabad and Mumbai, would be a ride for the rich, the Sena alleged, arguing that the money could've been spent to write off loans to distressed farmers. It has also asked why the bullet train project has been speeded up while existing infrastructure for the Railways is yet to be upgraded. The ally has also questioned the timing of the launch, alleging that the bullet train is aimed at giving "something new to the industrialists of Gujarat where elections are coming up shortly." 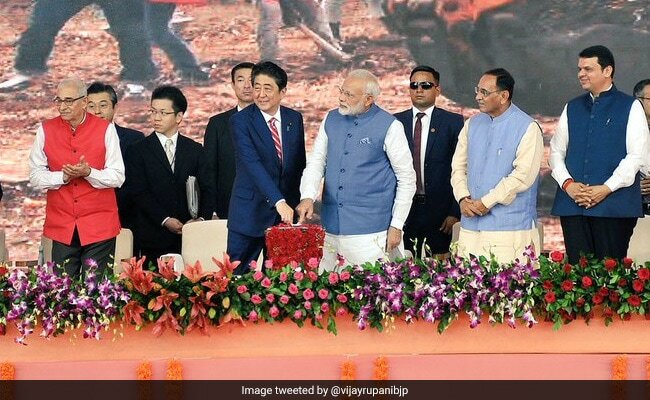 The Congress has asked why Japanese Prime Minister Shinzo Abe is being hosted by the Prime Minister in Gujarat and not in national capital Delhi. "We do not want to transgress propriety by commenting on a state visit but it is rather quixotic that the Prime Minister of a country as important as Japan, who is almost India's strategic partner in many respects, is strangely not even being hosted in Delhi," aid Congress spokesperson Manish Tewari, and added that he hoped the visit is not being used for "political purposes" in view of the elections in Gujarat.